While a junior at Mount Pisgah Academy, Abby Andrews signed up for a ShareHim trip. Andrews preached a series of sermons as part of the school’s ShareHim trip to Nicarauga. She spoke to a crowd that grew each night—starting out in the open air and ending with standing room only in a church building constructed by another group of students from the school. She felt the power of the Holy Spirit take control as she and her translator conducted the meetings. She experienced the warmth of the people. With speakers cranked top volume, she herself preaching to an entire neighborhood, not just the group gathered around her. She discovered, with her audience, the power of Christ as they watched video scenes from the life of Christ. 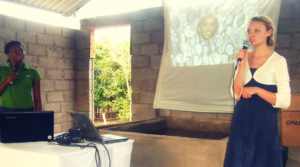 She traveled to Honduras on a ShareHim trip the next year, an experience altogether different but just as spiritually affirming. Andrews says the trips have transformed her perspective as she prepares for a career—and future life as a follower of Christ. She has led small group Bible studies in her dorm. She finds herself praying for her patients, confident in her faith and the power of God.